Competition is a process of economic rivalry between market players to attract customers. These market players can be multinational or domestic companies, wholesalers, retailer, or even the neighbourhood shopkeeper. In their pursuit to outdo rival enterprises, market players either adopt fair means (producing quality goods, being cost efficient, adopting appropriate technologies, etc.) or indulge in unfair measures (carrying out restrictive business practices – such as predatory pricing, exclusive dealing, tied selling, collusion, cartelisation, abuse of dominant position, etc.). Mittal Steel is appealing against a US$96 million fine handed down by South Africa's Competition Tribunal for excessive pricing. India's competition law is tipped to come into force by mid-2008, after the country's parliament this week approved the competition amendment bill. Australian treasurer Peter Costello has proposed reducing the burden of proof in predatory-pricing cases. Belgium's Competition Council has issued a final version of its new leniency programme. "By reading the book, one can know about 150 years of evolution of competition law, along with its different aspects of legislation and implementation. The book helps in categorising competition authorities worldwide on the basis of the different types of institutional structures they follow, which would be extremely useful while assessing their efficiencies". "There is no other publication which provides such a comprehensive overview of competition policy regimes around the globe. 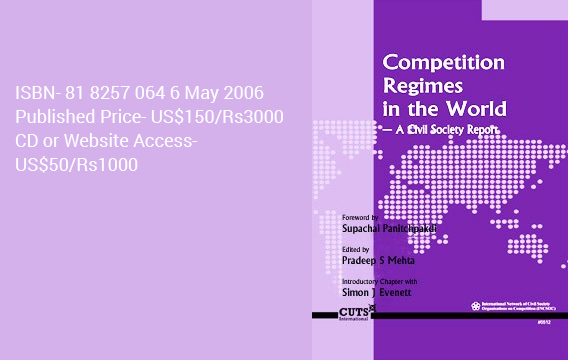 It is a very rich reference material, for researchers, lawyers and policy makers, and most especially for developing countries trying to develop a competition policy that would work for them. The book is worthy of all accolades".